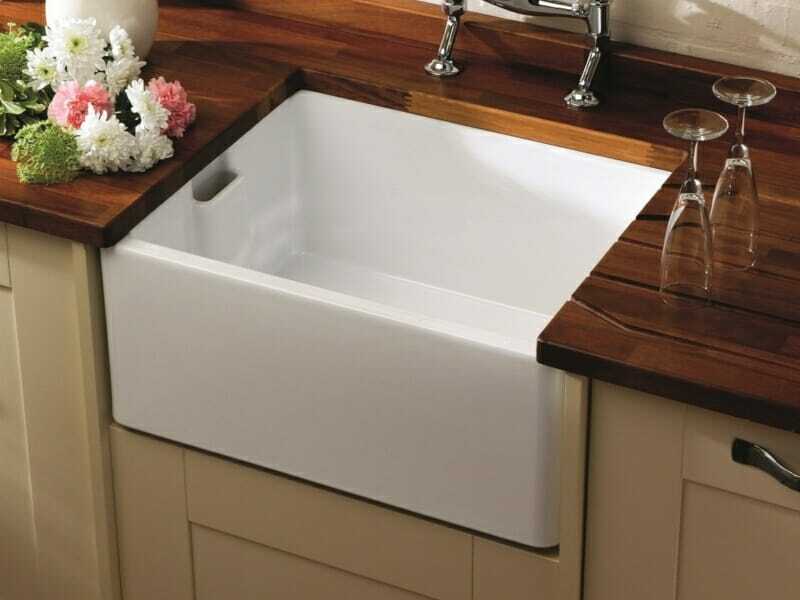 At Mastercraft we offer an immense range of sink styles and materials. We deal with all the famous brands such as Franke, Astracast, Blanco, Abode, Schock, Shaws etc. to name just a few. Far too many to show on our website! Our designers can recommend the best sink and offer the best deals when it comes to sinks. Stainless steel is extremely long lasting! 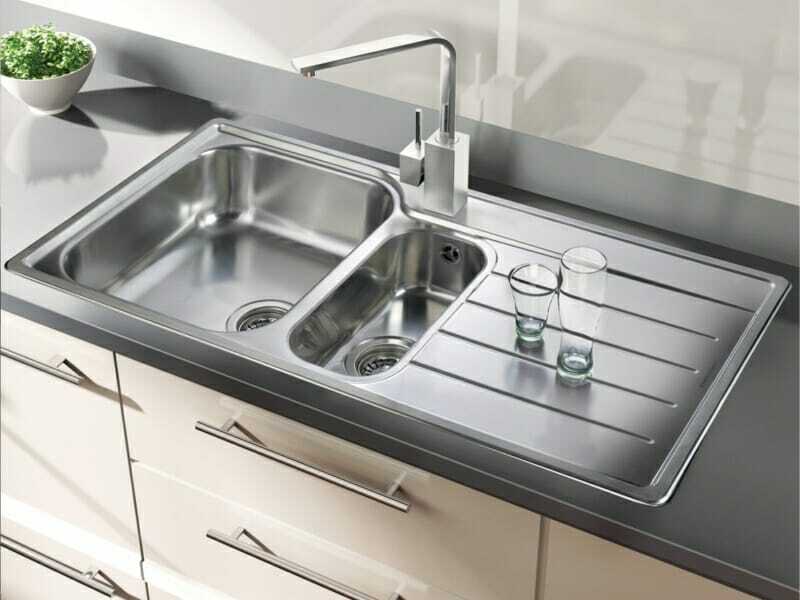 Given the fact that stainless steel is harder and tougher than any other sink material, no wonder it is highly resistant to chipping, cracking and premature wear. Therefore, if you want to ensure that your kitchen sink will serve you for many years to come, go for a stainless steel one. 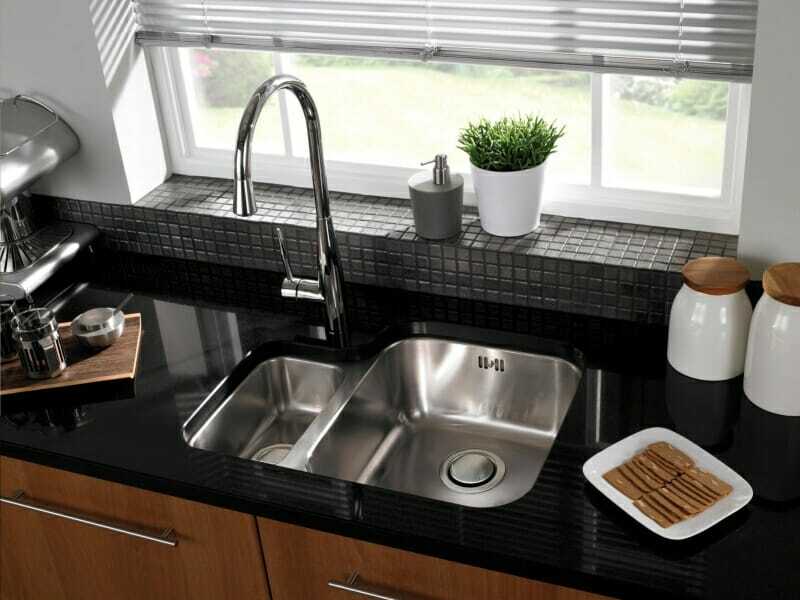 Granite composite sinks are constructed by gluing crushed granite together with a resin filler. 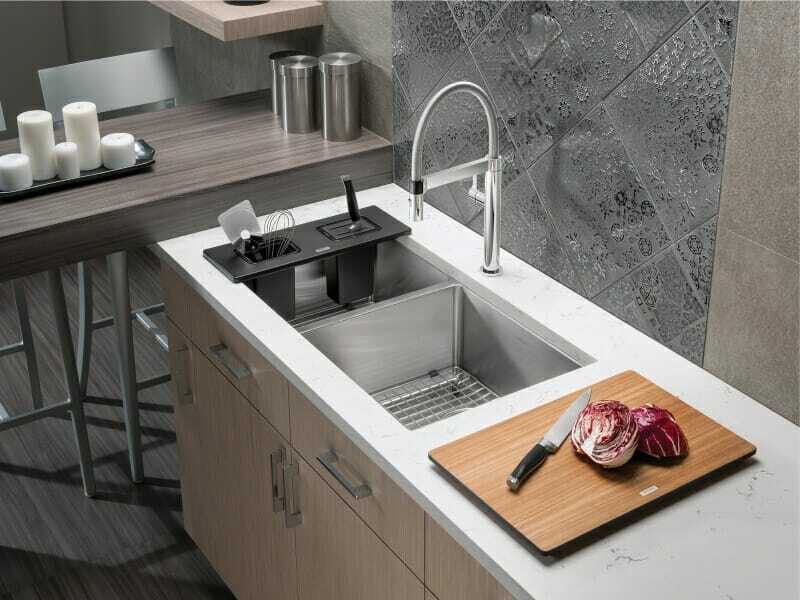 This type of sink is incredibly durable and stain resistant while also providing a cutting-edge and modern aesthetic to any kitchen. Granite composite has an inherent sound absorbing effect due to its density. If you’re considering a granite composite sink, they are heavier than stainless steel sinks, so we often have to consider adding structural support to accommodate for the extra weight. Fireclay ceramic sinks are made from clay and glaze fusing together at very high temperatures, upwards of 1600 degrees Fahrenheit. They won’t etch or stain and you can use abrasive cleaners without scratching unlike on a stainless steel sink. 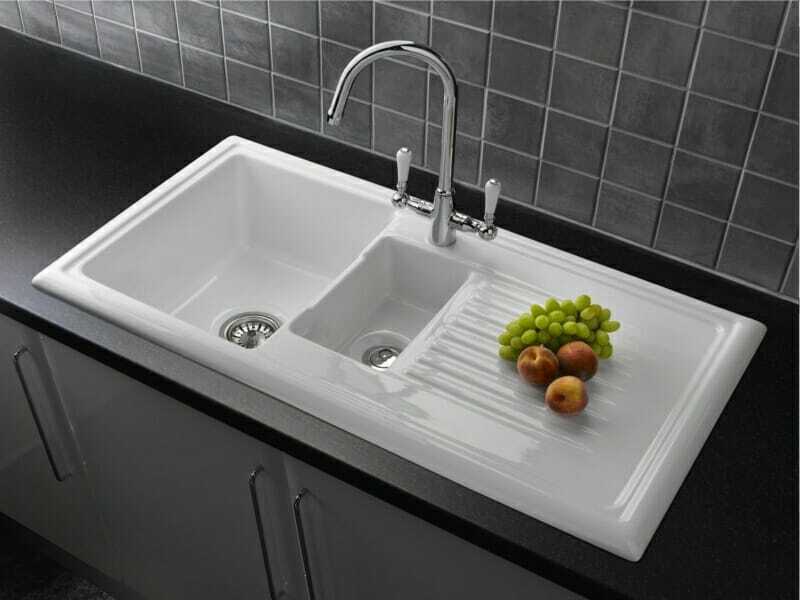 Fireclay sinks are usually more expensive than other materials due to the more extensive fabrication process. This material is often used for farmhouse-style belfast sinks but inset and undermount versions are also available. A Belfast or Farmhouse style sink, also known as an apron sink, often extends over the edge of your worktop. This type of sink is most commonly used in a traditional or rustic farmhouse style kitchen but can be designed in a contemporary setting. Available with a single bowl or double bowl they are incredibly durable and easy to clean because of their nonporous material. Farmhouse sinks have a deep basin perfect for big families, with lots of dishes and cleaning up. 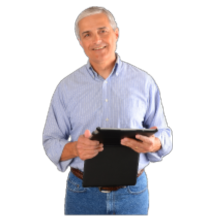 Top-end, bigger branded models can be pricey and are more difficult to install and transport because of their weight and size. An undermount sink is installed directly under the worktop, creating a seamless look from worktop to sink. 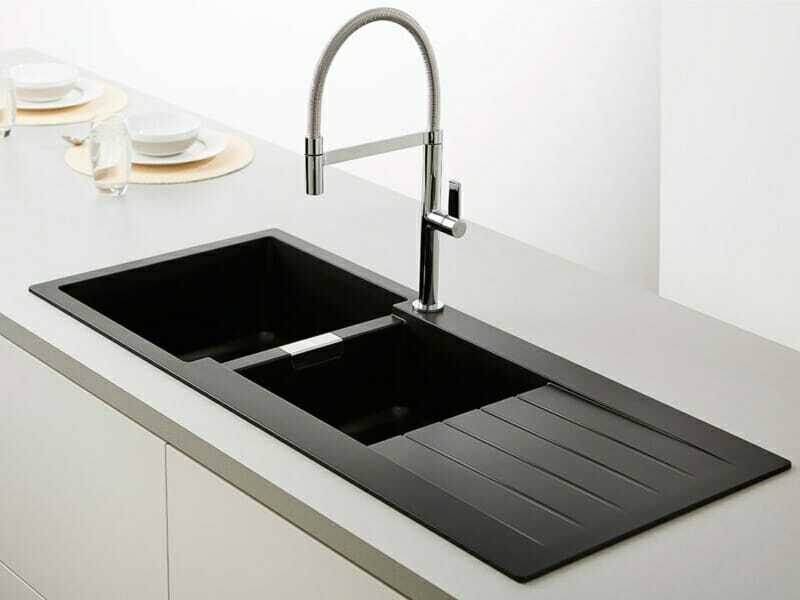 This type of sink is versatile and works with most kitchen designs. Not only do these sinks look sleek, but they also make for easy clean up because debris can be pushed straight into the sink without catching on a lip or rim. It’s worth noting that these sinks only really work well with solid worktop finishes such as quartz or granite. Draining grooves and sunken draining channels can be cut or routed into the quartz or granite worktop material. Nothing elevates your kitchen style like adding sink accessories that perfectly blend beauty, durability, and functionality to your sink. From custom stainless steel colanders to chopping boards, grids, soap dispensers, drain covers and strainers – we have everything to make your prep-work more pleasing. We also offer a full range of waste disposals, taps, boiling water taps and filtered water taps.